The pan is heavy (about 10 lbs), solid cast-iron. 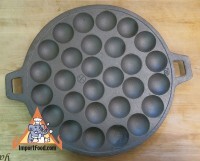 No two are the identical, everty pan is hand-poured cast iron. Made entirely by hand in Thailand using an ancient and labor-intensive process called 'Sand Casting'. 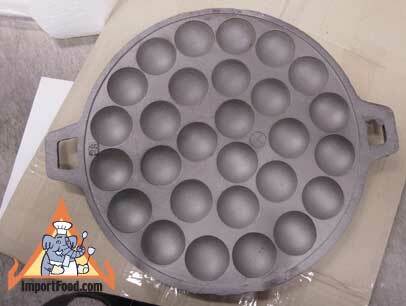 A sand mold is created for each and every pan. Molten iron is then poured into the mold cavity via a passageway created through the packed sand. Once the iron solidifies, the hardened sand is broken away to release the casting, and any excess iron not a part of the finished piece is trimmed or ground off. We carefully inspect and choose only the best, as we do not accept the relatively high percentage of pans that come out with flaws due to the sand not packed carefully enough. You can find see street vendors selling khanom krok on nearly every street thoughout the country. 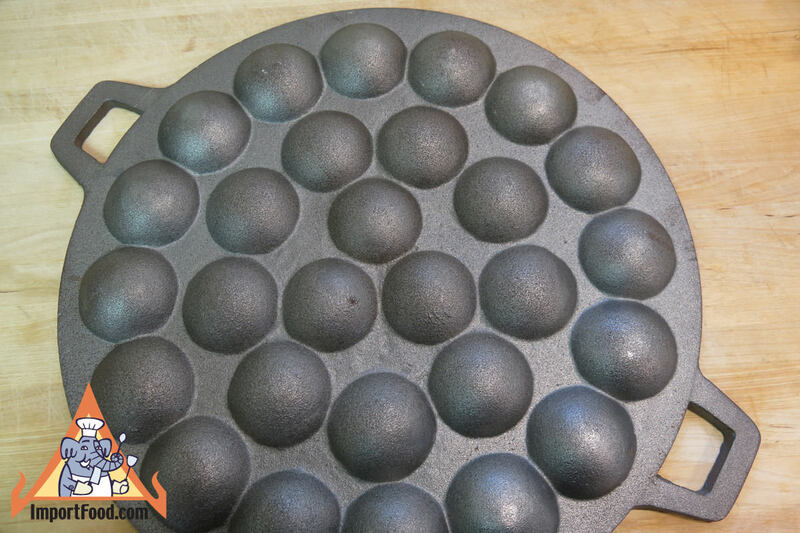 Own a legend of Thai cooking, and prepare the tastiest desert which delights the American and Thai pallette, with the Kanom Krok pan. 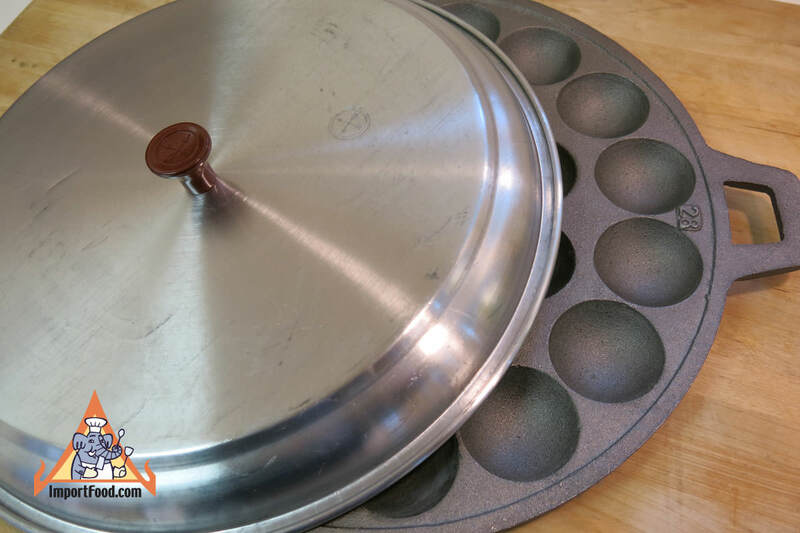 The pan is 16 inches wide (including the handles) and accomodates 28 kanom krok cakes. The pan should be seasoned once with vegetable oil before you start using it, and we provide instructions. 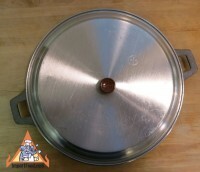 The pan is sold with a lightweight aluminum lid as shown. Kanom Krok is a special coconut pudding that's unique to Thailand, often prepared on the street-side by vendors who make it to order (see our street vendor video below). 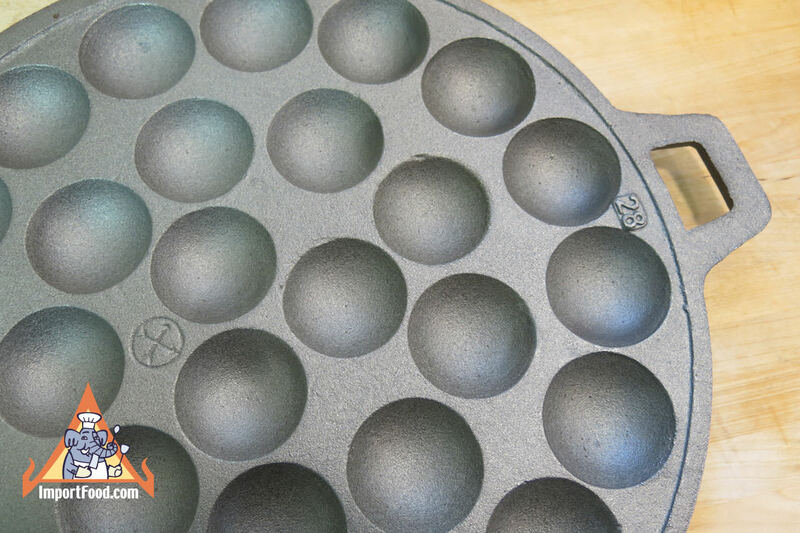 There are different minor variations, depending on the chef, and it's always prepared in a cast iron kanom krok pan, which we offer. Usually the pan is placed directly over charcoal in a round clay oven same as our Tao Burner (see photos below), but the pan works fine on a gas range or electric stove-top. We recommend making sure the pan is thoroughly heated but over medium (not high) heat.